The Tube is so against the English stereotype. It forces shy, proper, non-confrontational people into embarrassingly intimate and intrusively personal situations. On my way to Holborn, I was huddling with five strangers. If I could even get the elbow space to snap a picture, everyone’s gaze would be glued to the ground, the far off window or ribbing on the ceiling. 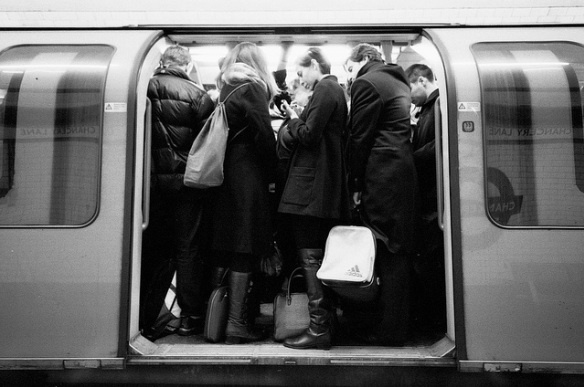 Passengers seem to ignoring their immediate reality, and pretend they’re anywhere else. While up above everyone goes his or her separate way, for a few minutes Londoners begrudgingly come together for their daily commute. And then when it’s time to get off, there’s a constant mumbling of “surry” as if to give an informal goodbye to the strangers who were nice enough to quietly ignore being elbowed or fallen on during the chaotic morning shuffle.